From the spectacular skylines and stunning architecture to the sensational food culture and superb art scene, summer in New York is an adventure like no other. As the balmy breeze replaces the wintry air, New York evolves into an urban jungle filled with street performers, artists, food stalls, festivals, markets and more. The possibilities are endless in the iconic ‘city that never sleeps’ from kayaking the Hudson River to Shakespeare in the Park and everything in between. Start planning your summer in New York with our travel expert Amanda’s list of the top attractions and events that you will only experience in the Big Apple. 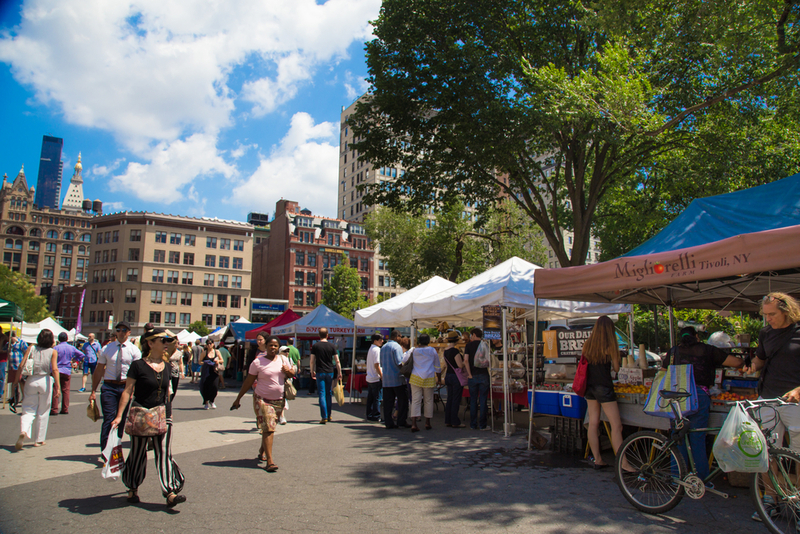 Established in 1967, the famous Union Square Greenmarket hosts the largest gathering of regional farmers, bakers, and fishers around and provides New Yorkers with the best locally grown and sourced foods the area has to offer. Frequented by locals and chefs, Greenmarket produces a bounty of fresh fruits and vegetables, meats and cheeses, artisan breads, jams, pickles, cut flowers, wine, coffee, ciders, honey and more. Greenmarket is a must during summer in New York offering the best variety of organic and local produce (perfect for picnics), and professional cooking demos, all in the Instagram-worthy location of Union Square. Take to the rooftops this summer in New York to experience cinema like never before. Rooftop Cinema Club at Skylawn features iconic films at sunset so you can experience the movies you love under the stars and surrounded by the panoramic views of the cityscape. Spectacular sunsets, an enchanting city backdrop, state of the art wireless headphones, comfy deck chairs (adjustable to the perfect angle) and a full-service bar, make Rooftop Cinema Club a must for the summer bucket list. Be sure to get there early for your pick of the best seats! 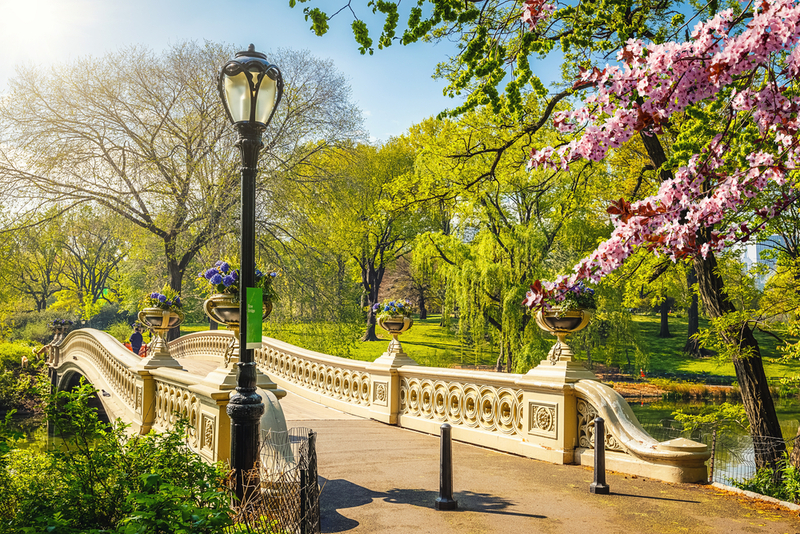 Escape to scenic Central Park to enjoy an afternoon of literary readings, boating on the lake, or sunbathing in Sheep’s Meadow. Summer activities include walking tours, catch and release fishing, yoga, running and fitness tours, hiking, and overnight camping. Visitors can also borrow a Field Day Kit consisting of a wiffle ball and bat, football, soccer ball, frisbee, jump ropes, cones and more from the North Meadow Rec Center. For a more laid-back afternoon enjoy some people watching, relive some of your favorite movie scenes, tour the park in a horse-drawn carriage, ride the Central Park carousel, catch a free concert, enjoy the Central Park Film Festival or attend Shakespeare in the Park. 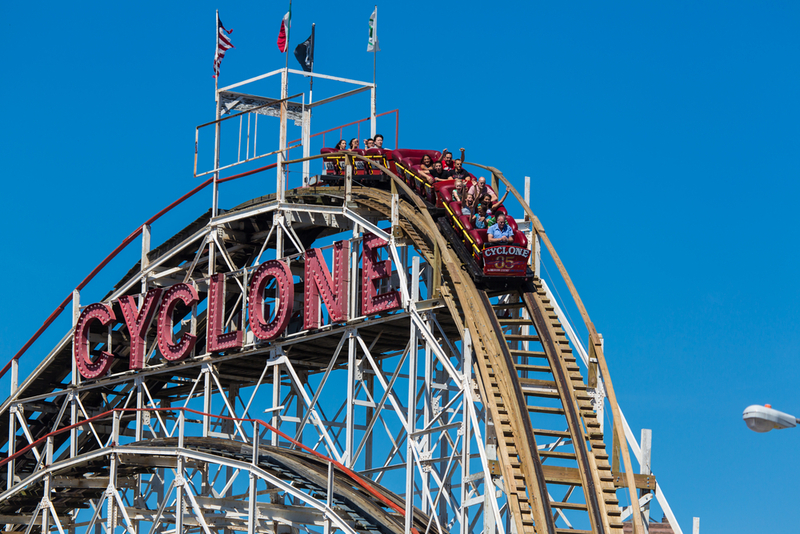 Coney Island – this legendary New York landmark is the epitome of American pop culture with its renowned boardwalk, iconic attractions, and scenic ocean views. For decades this waterfront promenade has been a nostalgic retreat from the sweltering pavements in the city and offers movie nights, concerts, shopping, rides, boardwalk games, a sandy beach, Friday night fireworks, and the ever-popular Mermaid Parade. Known as the largest weekly open-air food market in America, Smorgasburg is a must-see for any foodie desiring the ultimate dining experience. Smorgasburg showcases up to 100 food vendors serving a variety of stellar snacks and unique takes on classics from ramen burgers to deep-fried cookie dough. Be sure to bring an empty stomach (and a picnic blanket) to this weekly food festival and be ready to taste everything the New York food scene has to offer. Rather than spending hours on your feet, or on a bus that glides past every landmark, New York bike tours offer a convenient alternative to exploring everything the city has to offer. Biking provides tourists with the opportunity to cover more ground, interact with the city, explore hidden gems, and dive further into the diverse neighborhoods of New York. A great way to stay cool during the summer in New York is to hop in a kayak and soak in what is arguably some of the best views of Manhattan from the Hudson River. 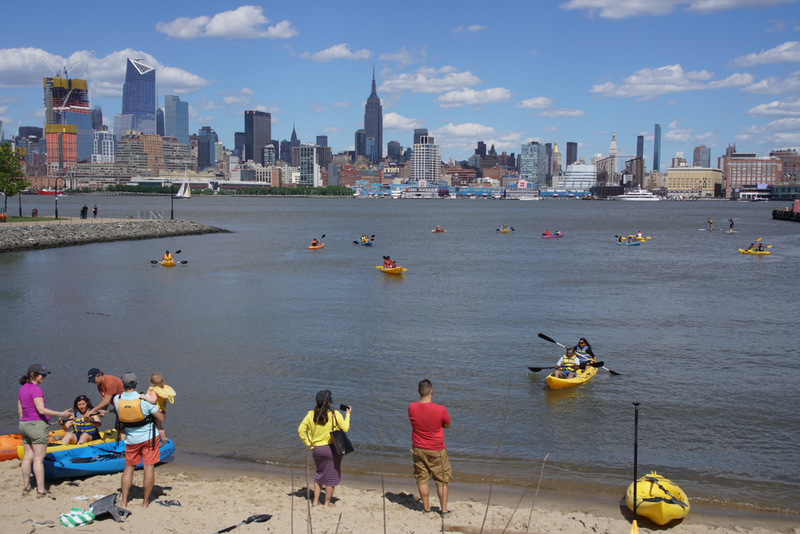 Kayaking the Hudson is a unique urban adventure for all ages and skill levels. Experience the tranquil river while you are surrounded by the distant sounds of the urban jungle and picturesque views of the cityscape. Once operating as an elevated freight line during the 1930s, The High Line has since been converted into a vibrant (and environmentally sustainable) greenway, home to more than 500 species of plant life. The park features lavish gardens, contemporary artwork, cultural festivals, seasonal food vendors and concerts featuring local musicians and dancers – all of which are free to the public. The High Line is the perfect way to view the city, absorb the culture and avoid the densely crowded tourist hot spots during hot summers in New York. 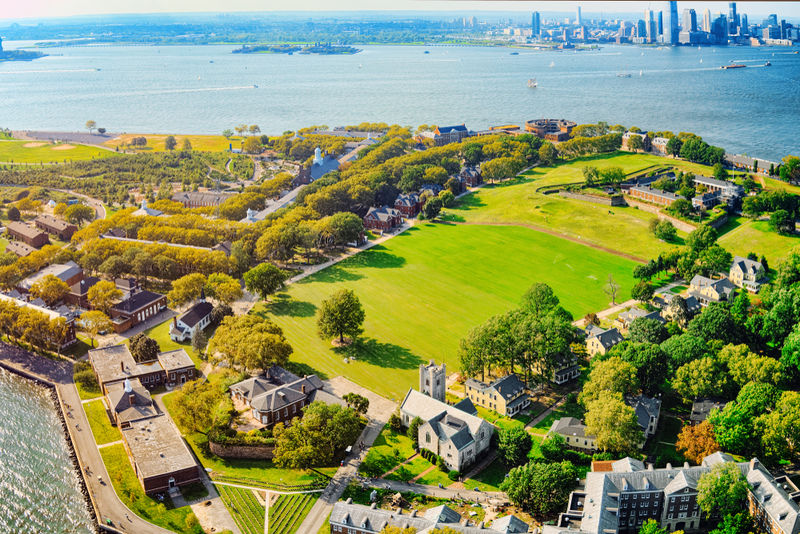 The ice cream cone shaped property of Governors Island resides in the heart of the New York harbor, surrounded by breathtaking views of the city skyline and the Statue of Liberty. Formerly an abandoned military base, the park is now a scenic destination created for relaxation and recreation, consisting of a 6-acre plaza, 10-acre grove of hammocks and trees, 14-acre lawn, and beautiful rolling hills overlooking the water. Equipped with impressive views, art exhibitions, rich ecology, popular festivals (including the Jazz Age Lawn Party), New York’s largest slide and endless outdoor activities, this new landmark is the perfect destination during your summer holiday in New York. The historic landmark of the Rockefeller Center offers visitors the opportunity to shop, dine and explore the city from a vantage point unlike any other. This famous New York attraction is known for its unique shopping experience, live recordings of popular shows, and the iconic observation deck complete with unobstructed 360-views of the cityscape. With something for everyone, and unlimited Instagram-worthy opportunities, the Rockefeller Center is perfect for tourists wanting to feel on top of the world. We hope you enjoyed our list of top summer sites and activities in the Big Apple. With so much to do and see, summer in New York is the perfect getaway. Discover everything the city has to offer for yourself and start planning your New York getaway! Contact us today to speak to one of our travel experts.